I do and have finally made a commitment to deal with it. Last week I began the process of decluttering my house and life! Down came the majolica plates and half of the oil paintings that I've collected over the years. I took down the plates and the Dijon colored paint. Tommy the Painter thinks I've flipped my lid! He painted the walls Dijon over ten years ago and can't wrap his mind around my plan. I told him to think of it as going from Dijon to Mayonnaise! The result is a cleaner, uncluttered look. Now I'm questioning this light fixture. It certainly was love at first sight but that love affair is over. I'm looking for something less......foo foo! 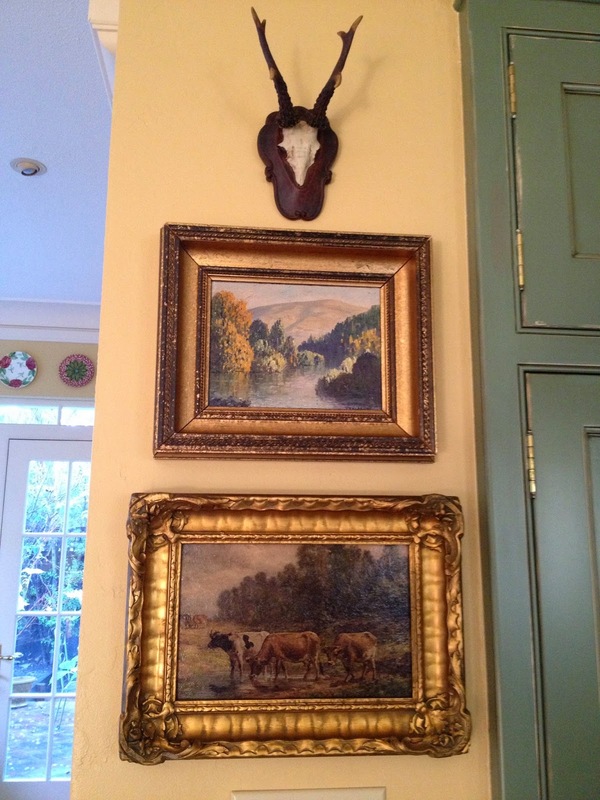 The Dijon color was at its best around the mantel as it gave a warm, cozy feel to the room. But not so much next to the green cabinets. Here's the cleaned up mantel in its preliminary staging. I like how important the black mantel looks now, much crisper and cleaner. Stay tuned for more before and after of the kitchen as it goes from Dijon to Mayonnaise! Loving the new look! Very pretty! just like shannon's comment above...at first i was a little worried because i love your "look" but knew whatever you had in mind would be fabulous and it is! i got rid of my "gold" walls a few years ago and went all neutrals and have never regretted it. i have only my husband's bathroom (chocolate brown) and one guest room (still gold) and those are getting a new look soon. Loving the new uncluttered lighter look. Can you share what color and manufacturer Mayonnaise is? It's good to have a clean slate sometimes... It looks wonderful so far! So many great built-ins..I feel grateful to have a few..
Love the new pastel palette. One day..I'll change it up.. Very pretty Delores! I think you did exactly the right thing, love the cleaner, simpler look! I say the Mayo looks great! LOVE the new lighter color Delores. We just had all brand new hardwood put throughout our whole first floor...with that every room needed to get repainted and I went much lighter, our colors look almost identical! Can't wait to see more!! I LOVE the new look. I wouldn't let your beautiful oil paintings go too far, though. Hahaha I love them and you may want to use them again. Just read this to my Mr. We are giggling as a year and a half ago, we changed from a Dijon to a creamy white. I guess mayonnaise. He also thought I had lost it. But I was just in need of a brighter feel. I am enjoying it. Have a wonderful rest of week Dolores. Looks so fresh and clean. Can't wait to see what you tackle next! I think two new "somethings" would look great over your table. I'm picturing some simple lanterns but maybe that is too obvious and trendy. What a wonderful post and straight from my heart as well! I LOVE the new look…in fact…I'm a huge fan of Mayo in the first place! Part of me wants to buy your majolica for my shop but I'm even trying to de clutter there as well! You are doing the right thing and the look is incredible! I love the walls with your green cabinets! Like you, I decluttered and lived with it for a while. Eventually I tired of the sparse look and slowly added back the things I had stored away.....:) I might be wrong but I think after time you will go back to wanting to surround yourself with all your beautiful things again. If not, first dibs on the majolica plates! You had me worried. I thought those beautiful oils and majolica were leaving. I get the need to update. I've done a bit of it myself. I'm anxious to see the developments! Hi, I'm loving the new look. I've always thought of your home as so warm, cozy and lovely. The new look still says those things to me, only in the fresher way you are going for. I'm changing my kitchen up a bit and added some things, but now I want to take them away, I just don't want clutter! Must be the stress of the times we are living in, I think. Love it!! I think the chandelier looks perfect in your breakfast room. It gives it such a wonderful unique character. So funny we are going to paint our yellow family room a different color as well. I like your saying mustard to mayo! LOL. It looks like a breath of fresh air D!! Great job!! Oh my gosh Delores, we are sooo similar! I had a yellow kitchen/family room until last fall. I just woke up one day and thought, "I cannot look at this yellow one more day!" And with that, I painted my entire downstairs, not only the kitchen and family room, but also dining and living rooms, cream and what I would call dark cream. I cleaned out my bookshelves so they would be less "cluttered" and even got rid of almost all my framed photos and cleared out a lot of items that were on the tables, etc. No one probably noticed any of this but me! But oh, it just feels soo much cleaner. I think your breakfast area already looks so much prettier (and I liked it before!) The only drawback? Now my garage is full of all that crap, most of it is too good to just give away and I've been lazy about listing or selling it all... if I lived up north, we could have a giant fire sale!! Delores, I've always loved the look of this room, but I can understand your desire for a change, especially since you've redone the kitchen with green cabinets. I need to declutter things here too, but it's hard for me. 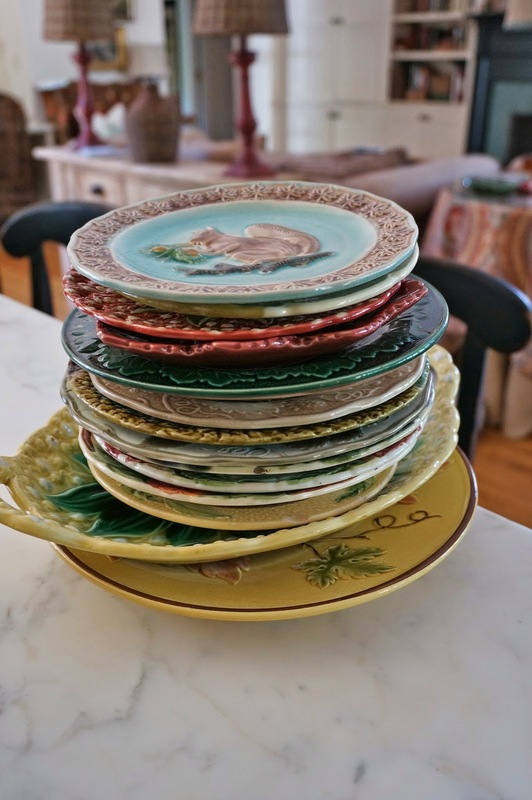 Seeing your pretty majolica plates stacked on the table made me a td sad. I hope you don't let go of your collections of paintings and plates. Love the new white look. That long table is such a great piece! Love your mayo! I have a big stack of those oil paintings too... what do we dare do with them? I've always been a fan of "less is more" so, of course, love what you are doing! The windows and the table now really stand out and look lovely! Good for you for trying a new look! Delores, I love the new lighter look! Wih all of your gorgeous woodwork, cream isn't at all bland. When we bought our house 3 years ago, ALL of the walls were brown!! I have since lightened up most of it and I love it. It is hard for me to put away or get rid of beloved collections, though. Can't wait to see the finished results!! I love the clean, fresh mayo paint. :-) I've been doing the same thing in our house. It started to feel like I had too much stuff to ever be able to use it all. It's felt very good to giveaway, sell or donate the extra. I love the lighter color on the walls, and I love,love your green cabinets. Your home is amazing and beautiful!!!!!!!! Doing the same here as I start a kitchen remodel! Please share the color you used. Please! Stunning! I have Dijon in my great room now and going with mayonnaise. After seeing your photos you've inspired me to start my painting project sooner than later! Thank you. What an amazing difference. I love the lighter look - perfect for Spring!! It must be Spring...a time of renewal. I have been discussing removing everything from all the surfaces and adding back only what I absolutely love. We'll see how that goes. I am generally a "more is more" girl. Your spaces are looking fresh and new. I too would like to know the Mayo color name and maker! As always, it looks fantastic! I love the creamy mayonnaise color. It looks very fresh and clean. But I have loved all of your looks. If you are looking for a good home for any of your treasures, look no further! I am just starting my collections! 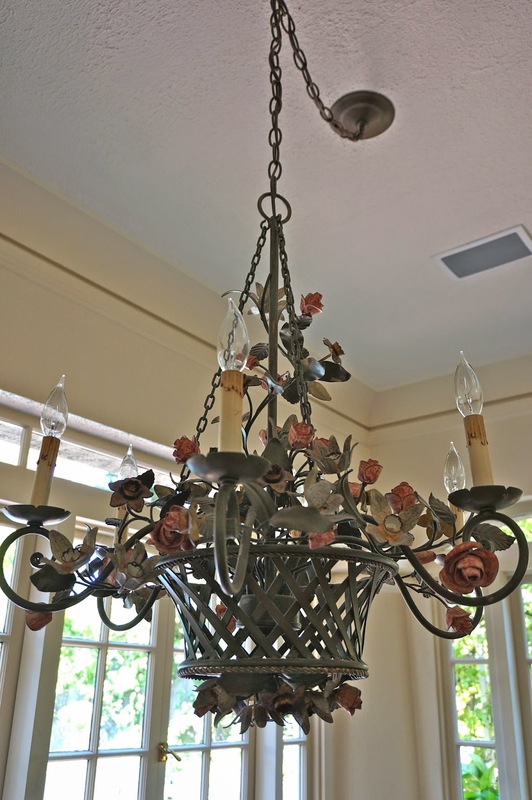 Enjoy your new rooms, and have fun looking for a new light fixture. Happy Easter! Love the "Mayo"! Nice fresh start to the season.